This project was such a pleasure to work on. I adore these clients, I know, I always love my clients, but this time it was different. I just feel so lucky to know them, and I have learned so much working with them! 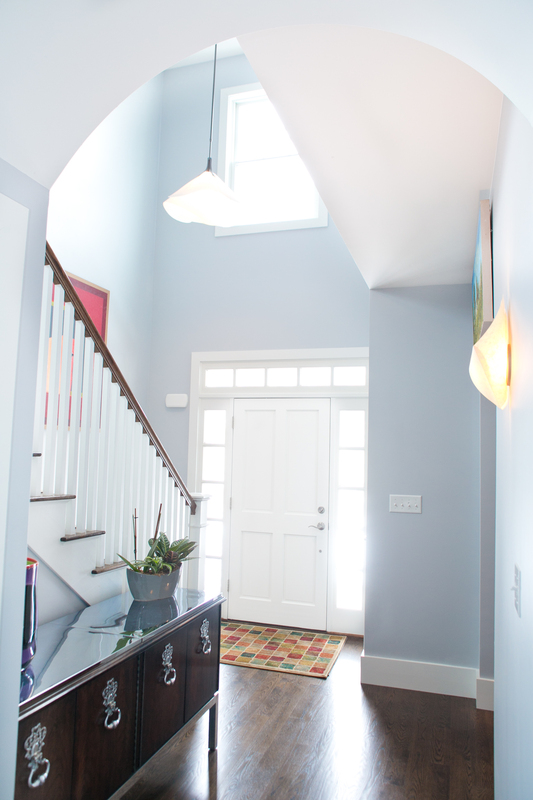 This hallway’s dark floor and gray walls make it so chic! The Hubbardton Forge light was made in a custom length to fit the space and it adds another artistic layer to the room. The light pours into this home! We wanted to keep a bright and airy feeling in this open concept home, so we used one large Mitchell Gold sectional rather than two smaller sofas. The result is a very appealing space. I love the big print fabric we choose for the drapes they add such drama to the space, without distracting from the home owners incredible collection of Maine art. Originally, we planned on making this room the dining room, but as construction neared the end, the home owners realized they did not need a formal dining room. 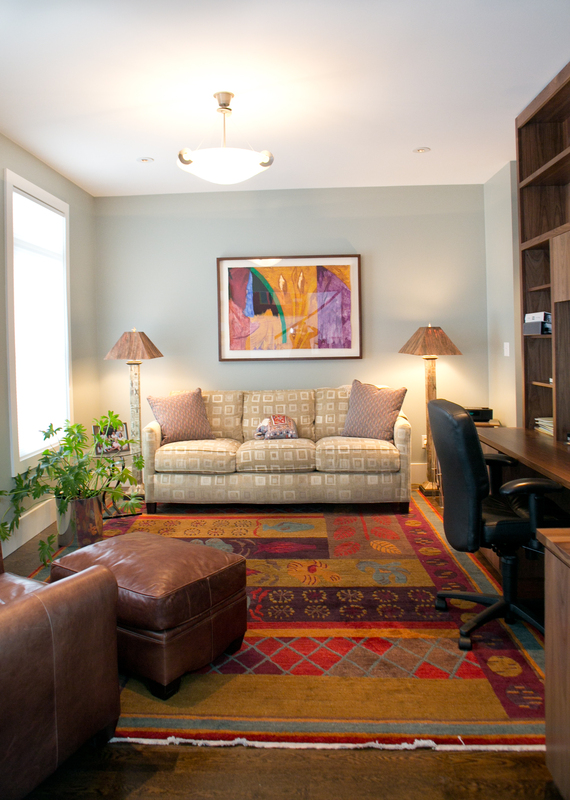 The room is now one of my favorites, it is a den/office. 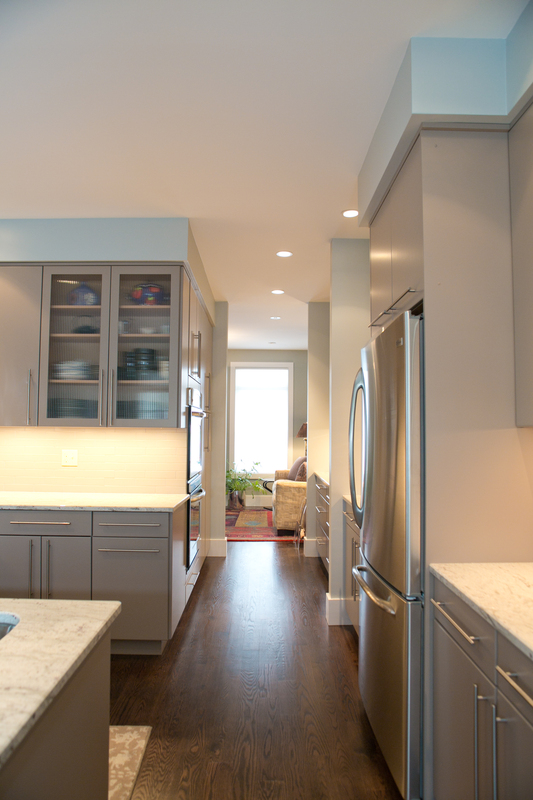 One of the most fun parts of this project was the kitchen. 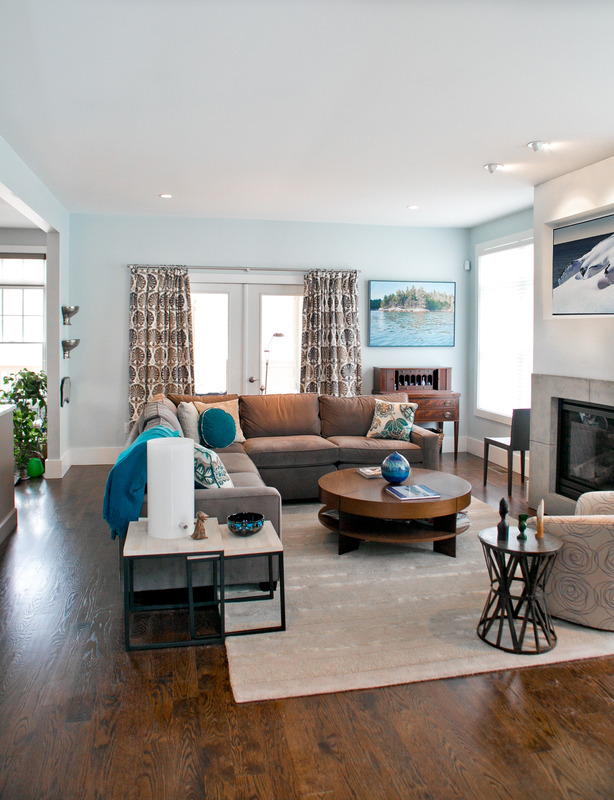 I grew up in a modern home and I love modern design, but most of my work is transitional or coastal. I loved tapping into the modern side of design for a change! 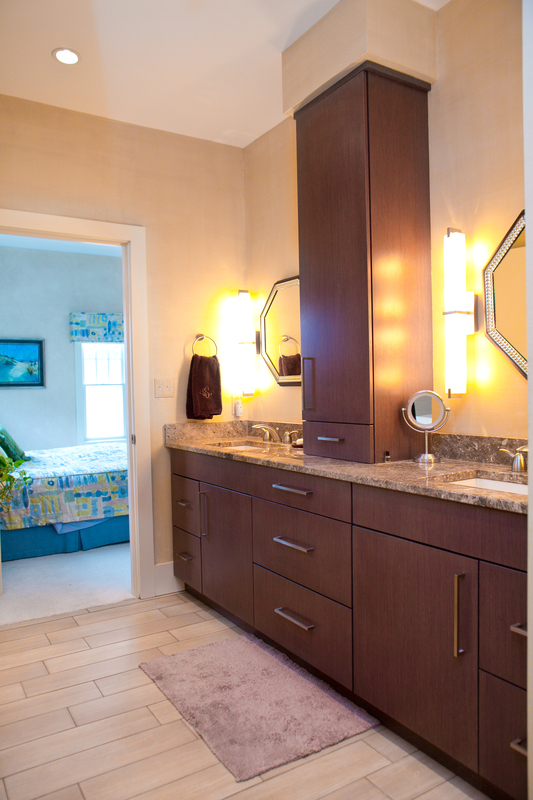 We used Brookhaven Frameless cabinetry, they are really slick! River White Granite counters add movement to the room but do not take away from the overall feeling of calm in the kitchen. 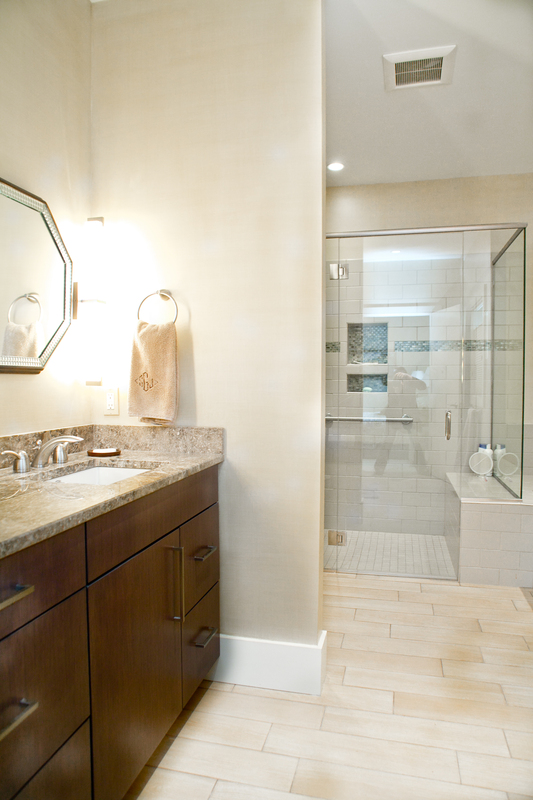 The Master bath is a masterpiece! I love the bleached plank wood-look floors. 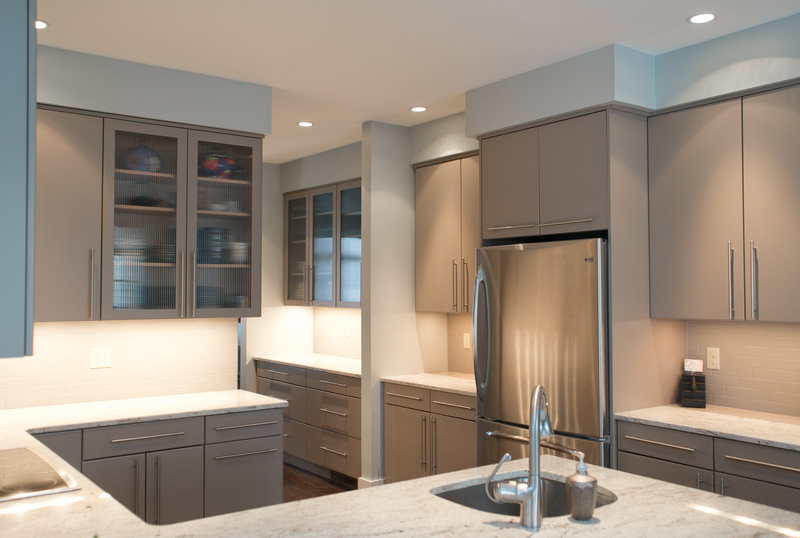 The Breccia Paradiso marble is amazing, and it looks wonderful on these dark wood Brookhaven cabinets. I feel so fortunate to have worked with such a great team on this project. Special thanks to Eliot Hull & Rich Gallo at Paul.G.White in Portland, Maine for their fantastic cabinets, counters and tiling. Special, Special thank you to Rachel Ambrose and Lisa Hincher from Home Remedies in Portland, Maine for their help with furniture, fabric and upholstering! If you are not a part of the Celia Bedilia family…sign up to follow our blog by clicking the follow button! If you have something to tell me comment, and if you like us let us know.